A WOUND IN TIME: VISIT MY PRODUCTION COMPANY BLOG FOR ALL THAT'S NEW IN MY CULTURAL ACTIVISM! VISIT MY PRODUCTION COMPANY BLOG FOR ALL THAT'S NEW IN MY CULTURAL ACTIVISM! JUST CLICK THE TITLE OF THIS POST TO LEARN ABOUT ALL THE ACTIVITY OF MY PRODUCTION COMPANY AND THE FIGHT TO FOSTER APPRECIATION FOR CULTURAL DIVERSITY AND FIGHT IGNORANCE THROUGH THE ARTS. 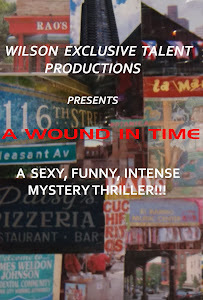 ALTHOUGH A GRIPPING MYSTERY/THRILLER "A WOUND IN TIME" CONFRONTS MANY SOCIAL ISSUES AS WELL. THIS IS THE GOAL OF WILSON EXCLUSIVE TALENT PRODUCTIONS!